Loria Consulting is an accredited Sage Business Partner, providing a range of services to assist with the planning, purchase, implementation and ongoing support of Sage CRM. Sage CRM On-Premise provides full functionality with options for mobile CRM and integration with Sage 200 and Sage 300 ERP solutions as well as other back-office systems. Sage CRM Hosted delivers the full functionality of Sage CRM, but provides this as a monthly subscription service on a fully managed server that we look after for you, so that you don't have to worry about software updates or hardware maintenance. 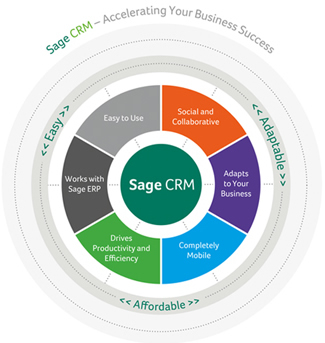 LoriaLINK allows Sage CRM to be integrated with Sage 50 and many other back office applications. Whether you already have an existing Sage CRM system or are looking to implement your first CRM we would be pleased to advise you. Please call us on 01444 810 519 to find out more about how Sage CRM can help your business.